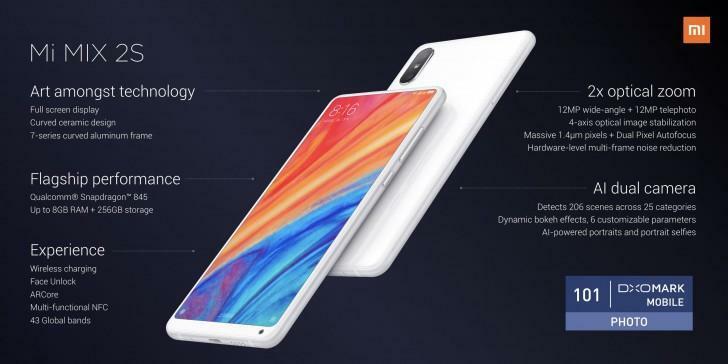 Xiaomi’s bezel-less beauty Mi Mix 2 got its successor today with the launch of Mi Mix 2S, and the device unveiled today will be launching in China as well as in some Asian countries in the coming weeks. However, it won’t ever likely make to the USA anytime soon. The Mi Mix 2S looks identical on the front, and we don’t see any bezel reduction on the front, while on the rear, the Mi Mix 2S takes a lot of design cues from the Apple iPhone X. The design is similar to the last year’s Mi Mix 2 with just a millimeter being cut-off from the front bezel, making it taller for the 18:9 standards with its 5.99-inch Full-HD+ IPS LCD, an AMOLED panel would have been a better choice. But the screen to body ratio is exceptional at 82%. The Mi Mix 2S has a bottom bezel, with a front camera integrated into it. The rear is made of glass/ceramic for the top variant, with a vertically stacked Dual-camera setup and a fingerprint scanner. On the specs, we have the latest Qualcomm Snapdragon 845 based on custom Kyro cores, which is clocked at 2.8GHz for the four high-end cores, while the power efficient 4 cores are clocked at 1.8GHz, which is coupled with a high-end Adreno 630 GPU to push all those pixels. Which is paired with either 6GB or 8GB RAM, along with 64GB, 128GB and the top of the line 256GB variant is also available now, but it doesn’t support an sd-card for expansion. Comes with MIUI 9 based on Android Oreo 8.0 and shall probably get Android P 9.0 when it officially comes out. Moving towards the main highlight of the device are its exceptional dual-cameras which are a step up from its predecessor’s single-camera setup. The primary sensor is a 12 MP RGB sensor with an aperture of f/1.8(Sony’s flagship mobile camera sensor IMX 363), while the second one is also a 12 MP Telephoto lens capable of producing lossless 2x Zoom coming at an aperture of f/2.4(a Samsung S5K3M3 is doing the duty here). And DXO mark rates this camera on the Mi Mix 2S the highest ever seen yet in a smartphone at 101 points/score. Mi Mix 2S utilizes dual-pixel technology joins hands with AI which further helps in enhancing images for better quality, scene detection, and details preservation as well. And on top of it, machine learning helps the Mi Mix 2S to distinguish between the subject and background by learning from thousands of portraits shots. Thus resulting in superior edge detection which could rival Google’s Pixel 2 devices. Handling the selfie department is a 5 MP snapper with beautification baked in and is capable of recording Full-HD videos. Battery Life 6-8 hours on average usage. Light-up the pixels is a decent 3400mAh battery with fast charging support; apart from that this is the worlds first device to support Qi charging standards, that means Wireless charging is available on the ceramic back of the Mi Mix 2S. Pricing is pretty reasonable for what it offers with the base variant Mi Mix 2S starting at just $530 that is CNY3299, for 6GB RAM and 64GB storage option. The 128GB+6GB variant will retail for CNY3599, $575 which is an absolute steal. While the range-topping 8GB+256GB variant is for $640 (CNY 3999). 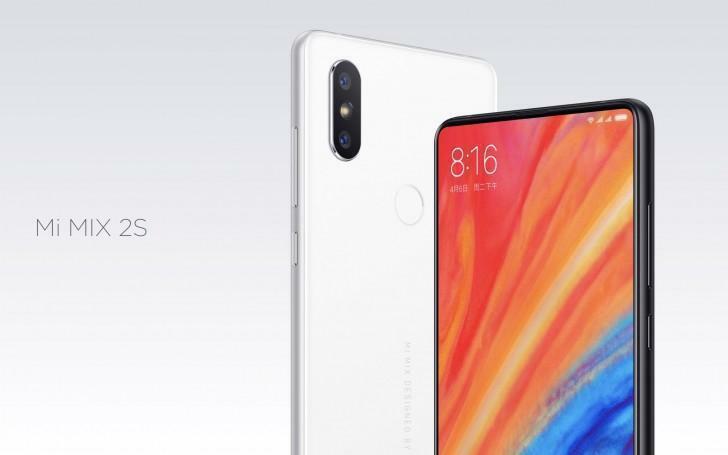 The Mi Mix 2S goes on sale in April in China on Xiaomi’s Mi online site as well in Mi stores around the country. He has been working in the field of blogging for over 5 years now and has a passion for upcoming technology and latest gadgets. When he is not working he likes to go on long drives and listen to pop music. 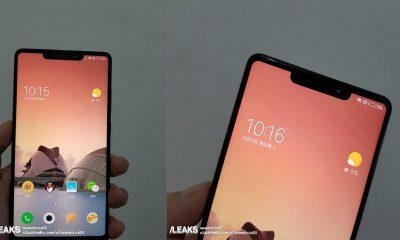 Xiaomi’s Mi MIX 2S Leaked in Images, Real or Fake?